Director Ryszard Bugajski is famed for shooting one of the most controversial films ever made in communist Poland. That movie, Przesłuchanie (Interrogation, 1982), was in fact so controversial that it was banned outright, eventually compelling the director to emigrate to Canada (the film was belatedly honoured at Cannes in 1990). Bugajski hasn’t veered much beyond the realm of television drama since then, but now he has returned, and with an appropriately explosive theme. General Nil follows the plight of Emil Fieldorf, codename Nil (after the River Nile), leader of one of the crack divisions of Poland’s wartime underground army. 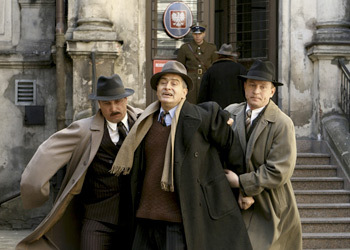 The film opens with vivid scenes of the attack on Warsaw’s Nazi Chief of Police, Franz Kutschera, yet the focus moves swiftly to Fieldorf’s post-war dilemmas, which were no less dramatic. Like Andrzej Wajda’s Katyń (2007), this is a film that could not have been made before 1990. And Bugajski shows that he has lost none of his touch. He is not overly interested in fancy camerawork, but rather in creating a claustrophobic atmosphere that traps the viewer in the fearful, distrustful world of Stalinist Poland. Olgierd Łukasiewicz, who has many notable roles behind him, takes the lead, and his understated rendering of the general may well endure as his finest performance. His presence carries the film, lingering long in the memory. General Nil offers gruelling portrayals of both mental and physical torture – this is not the kind of film you would take a sweetheart to on an early date. But the results prove that Poland still has directors – and actors – of the highest calibre. The film has its faults – the burning of the photograph of Kutschera seems a misjudged, Hollywood style concession, as does the unexpected reappearance of a certain character at the end of the film. There are one or two similar flaws. But all in all this is superlative film, and we can only hope that Mr. Bugajski won’t hang up his directorial hat just yet. *General Nil is playing in Polish.